If you’re not a morning person, you’re probably rolling your eyes right about now. Don’t hate me. It’s how I was made, just like you were made to get your mojo on around 4:30 in the afternoon (yawn). I’ve always been this way. Even when my babies kept me awake all night, I still loved mornings; who can resist the snuggly bed-headed toddler lugging his bedraggled bunny? Not me. Mornings are a chance for a fresh start. If you read this blog regularly, or follow me online, the you know I have this thing about the prefix re-, which means, “again, back, once more.” There’s a word in the Hebrew that express it beautifully: shuwb. It means to return, restore, refresh, repair. We serve a “Re- God!” His mercies are new every morning. “Return,” He says, “I will restore.” With God, every day is a do-over. Morning person or not, we all have to face a new day, every single day. The question is, how? WELCOME! SUBSCRIBE BELOW & NEVER MISS A POST. CLICK ON IMAGE TO PREVIEW OUR CD! Do you begin the holidays with high hopes and end up with headaches? 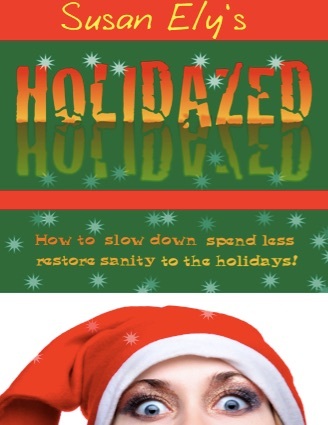 Check out my book Holidazed. CLICK THE IMAGE! Thank you for your powerful spiritual messages, Susan. God truly spoke through you in a mighty way! Your messages were a rich blessing to each of us! I learned so much from the way you prepared to help me as I prepare for Bible Studies. Thank you for participating in the Call to Prayer. Your presentation was powerful and prepared our hearts for prayer. We came away from the morning knowing we had been in God’s presence. I loved your “invitation” opening. Its one of those ways your listeners will recall your message of the wonder that Almighty God as gone to such lengths to give us his word. Susan Ely, thank you for sharing your amazing testimony with CWC today. God is using you in more ways than you’ll ever know. Totally Awesome! A year since our retreat… and in this season of my life, I have begun to once again apply your “Re-words.” Yours yesterday was God’s timing for me … and today, also! Thanks so much! We were so blessed to have you share your message and journey with us. So many members wanted me to let you know that you touched their hearts and souls and I am sure the 1st timers were given hope and reassurance by your words. I hope we have a chance to cross paths again. susanely on What are you waiting for? Hazel Fox on What are you waiting for? Jana on What are you waiting for? Copyright © 2019 SUSAN ELY. Powered by WordPress. Theme: Accelerate by ThemeGrill.